Assignments are given throughout the day. On all assignments, students are expected to answer open-ended questions in COMPLETE sentences, and/or show all work. Students must complete all assignments neatly and on their own. They should only ask for help when they have given their best effort first. All assignments will be due the next class period unless otherwise specified. It is expected that students will attend school every day, but if a student must be absent for any reason, please inform the office. When the child returns to school, he or she will find a planner page on the desk. All of the assignments will be listed or attached. Students have the same number of days they were gone to make up the work. Let the office know if you want to pick up your child’s work or if it should be sent home with a sibling or neighbor. Students are expected to show appropriate behavior in the classroom, the school building, and grounds. It is my expectation that all students will behave in a manner that is acceptable and allows others to enjoy their rights and earned privileges. Each student has a binder that they should carry between home and school each day. Their binders should hold folders for work as well as their notebook paper. In addition, students should carry their planners in their binders. The binder is a wonderful tool to help students organize their assignments and other handouts. All assignments, completed or not completed, are to be kept in their binder. This should eliminate most lost/misplaced assignments. I check my e-mail throughout the day; I encourage you to contact me in this way. My school phone number is 636-464-4451; leave a voicemail and I’ll return your call as soon as possible. 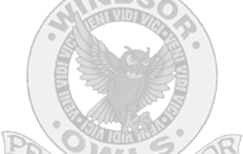 A school calendar is available on the district website: http://windsor.k12.mo.us. In addition, look for the Owl Gazette your child will bring home each Friday. The report will inform parents of behavior concerns, list the number of missing and late assignments for the week, and any D/F papers. Parents should review and sign the report and return it to school. This will be in the Friday Folder, along with any completed and graded work. Classroom assignments are due the next school day after they are assigned, unless specified otherwise. Class time is usually given to complete assignments. Students will need to finish an assignment at home if it is not completed during the work time given during class. Projects and other large assignments will have a due date provided with the assignment. Students have a Friday Folder. They will bring home their papers and notes from school in their Friday Folders, on Friday (or the last day of the week). Please make an effort to look over these papers carefully with your child. The emptied Friday folder along with the signed Teacher’s Messenger needs to be returned to school on Monday (or the next day back to school). By returning the messenger I know that you are aware of the progress your child is making. Unfinished Work-is work that is not completed in class and is within the student’s capability to finish at home. Students who are quick workers or who use their class time wisely may never have this type of homework. If your student is overwhelmed with unfinished work we need to discuss why that may be occurring. Weekly Reviews will be given on Monday and will be due on Friday. Review—Students should devote time at home to studying and preparing for assessments/tests. A school provided planner will be used to record daily assignments, projects, and tests. Notes from the teacher may also appear in the planner. Students need to have their parents sign their planners each night. Donations are accepted and appreciated: dry erase markers, paper towels, post-its——–THANK YOU! Study hall is assigned by a teacher to allow a student to complete late or missing assignments. It is also assigned by a teacher to have a student complete a “think sheet” regarding behavior choices. Students may also go to study hall voluntarily, but must work on school work while in study hall. Physical activity is encouraged and it is preferred that students attend recess time with their peers. However, sometimes situations occur that a student may choose to go to study hall. If your child is to go home a different way than usual, I MUST have a note given to me in the morning. Your child will then have it approved and recorded in the office. Your child will give the bus driver the bus pass. Early pick-up: We are very busy all day in our class. Please try to arrange doctor/dentist appointments outside of school hours because anytime your child comes in late or leaves early they miss valuable instruction. If you need to check your child in or out during the day, please come to the office first. They will call for your child to meet you in the office. Sending notice of early pick-up can aid in quicker check out.